In September 2015, I quit my job (again) to publish Fearless Salary Negotiation and start bootstrapping a business. So the one-sentence summary for 2015 would’ve been: Write and publish my book. My one-sentence summary for 2016 is: Build infrastructure to turn the book into a business. How did I do in 2016? For 2016, I thought I would just publish the book, build some products to augment the book (video courses), ramp up to enough revenue to cover all my bills and then return my focus to TaskBook. I hoped to do that early in 2016. If you’ve built a business, you know how silly this plan was, especially considering I was more or less starting from scratch. Yes, I had published a book. But that was it. I had something like 700 people on my mailing list when I launched the book, and somehow I thought I was heading to enough monthly revenue to pay all my bills from digital products early in 2016? Who was going to buy all these products? On average, I made about half of what I would’ve needed to pay all my bills in 2016. That’s the bad news. The good news is that I finished the year on a five-month stretch of basically paying all my personal and business expenses. So it took me almost a year, but I am paying my bills, and my business is profitable. Of course, the ultimate goal is to make multiples of my previous day-job salary. But that’s going to take a while, so I need smaller goals in between. The first one was “Pay all my bills”. The next one is “Make a decent living”. What I now realize is that 2016 was another foundational year. If 2015 was “Write and publish my book.”, then 2016 was: Build infrastructure to turn the book into a business. For 2017 I have a more strategic focus, supported by tactics, to build on the infrastructure I created in 2016. It feels like this is the difference between working in the business and working on the business. I’m not exactly sure what that means, but I think that’s what’s going on. I’m moving out one level from working in the business—building products, building a web site—to working on it by growing it. I’ve built a lot of great things in 2016, and now it’s time to grow my business and revenue. Building new products is extremely challenging and time consuming. But now that those things are built, I can reallocate that time to growing my business. So I don’t plan to create many products in 2017, and will turn my focus to finding my niche and finding the right customers to benefit from the products I have built. I’m sure I’ll build something new, but I’m planning to resist the urge to make make make. I think “the right customers” for my business are software developers. I like working with devs and they are generally positioned to gain a lot from my expertise. In many ways 2016 was just a series of experiments with different markets, and every time I worked with devs, or made something specifically for devs, the response was tremendous. For example, this article on How software developers can get a raise without changing jobs has been viewed over 30,000 times so far. It’s pretty obvious that this is where I should focus, so that’s what I’ll do in 2017. By the end of 2017, I would like to have 100,000 visits from organic search per month. That’s about 15 times what I’m getting right now. There was a time when this goal would’ve seemed totally unattainable, but I know what I need to do, and I just need to execute. The problem with this goal is that much of this is out of my control. An algorithm change or something else could wipe me out. The good news is that if I do the right things to drive this number, lots of other numbers will improve. As I’ll talk about in my detailed recap below, organic traffic has been a lagging indicator that I’m doing the right things, and I’m really interested in this stat as a proxy for other things going well. If those things go well and this stat tanks, then so be it. What’s interesting is I have no idea if this is a stretch goal, or low-hanging fruit. One one hand, 100,000 organic visits per month seems like a huge number. On the other hand, I’ve consistently tripled organic traffic every 60 days for a year. I don’t think that’s sustainable, but I also didn’t think it was sustainable a few months ago and here I am. If I keep up that pace (again, it sure seems like this is totally unsustainable), I’ll hit 100,000 organic monthly visits in July or August 2017—plenty of time to spare. I’m basically breaking even right now—my savings account is no longer shrinking, but it’s also not growing. And I’m living very lean to make that happen. “Make a decent living” would mean replacing about half of my previous day job income, starting to re-grow my savings account, and opening up my personal budget a little bit. I’m not really swinging for the fences here, but that’s because I’ve learned that this is likely to be a slow, steady grind forward. Hopefully I blow this goal out of the water, but I’m not counting on it. Maybe “Make good money” will be a goal for 2018. I managed to re-record about 70% of my audiobook after learning some tough lessons earlier this year, but then I ran out of steam. I would like to get this project finished, and I’m hoping to get back to it early in 2017. We’ll see. Here’s a look back at what I built in 2016. Most of these things are new things I built in 2016. Plus there’s a TaskBook update for those who are curious. 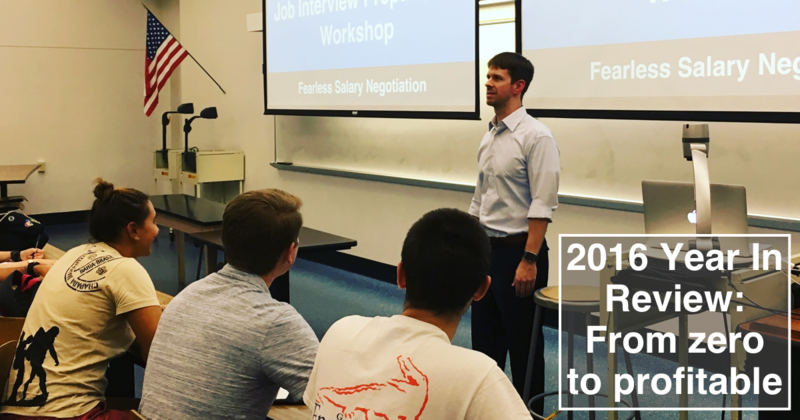 I started the year by building video courses to accompany Fearless Salary Negotiation. I know a lot of people learn visually and need action items and next steps, and I wanted to give them a way to learn and apply my strategies and tactics. This was the hardest part of 2016 by far. Not only did I have to create all the content (about 400 slides, each one scripted word-for-word), but I had to learn how to record and edit audio, video and screencasts. Meanwhile, my monthly revenue was close to zero and I had to spend about $2,000 on my car. It took me about 10 weeks of non-stop work, but I got everything done and I’m very happy with the result. The result is over three hours of quality screencasts that augment the book and visually illustrate key concepts so they’re easier to understand and use. I started out here on JoshDoody.com. Once I picked a title for my book, I registered FearlessSalaryNegotiation.com and published a few sales pages, but I still kept writing and pointing everything to JoshDoody.com. In March this year, I realized that Fearless Salary Negotiation was its own brand and that I needed to start treating it that way. So I redesigned the site, moved to a new platform, and started publishing new content there. At the time, FearlessSalaryNegotiation.com had about 10 pages total. Now it has over 150 pages, and I’ve built every single one. About 60 of those pages are the online version of the book. The rest are a mix of articles, landing pages, and sales pages. I’ve been coaching people since I started writing my book because I needed to know exactly what was happening in interviews, salary negotiations, and raise and promotion discussions. At first I didn’t charge anything and I worked with friends and family, then friends of friends. I did that for over a year. Then I got a call from a friend who said, “I have a big job opportunity and I don’t want to mess up this negotiation. What’s your consulting rate?” I…didn’t have a rate, but I knew she was a freelancer, so I said, “Whatever your rate is.” She charged $75 an hour, so that’s what I charged. Then another friend reached out and since my first client didn’t flinch, I charged $120 an hour. Again, no hesitation, so I knew I needed to raise my rate again. After a 30-minute conversation, I was planning to charge $1,500 for a fixed-fee engagement with a money-back guarantee. I would promise to increase my clients’ base salary by at least $10,000, so this would be a slam dunk ROI calculation. Looking back, I’m not sure I actually believed I could find clients who would pay me $1,500 to coach them. (This was classic Imposter Syndrome at work.) Sure, I had made people tens of thousands of dollars. Sure, I knew what I was doing and my previous clients (paid and pro bono) had loved working with me. But would strangers really pay me $1,500 to help them bump their salary by $10,000? You bet they would! But they didn’t much care about the $10,000 promise and I think it actually worked against me early on. $10,000 is a lot of money to some people, but it’s not much money to other people. For those other people, a $10,000 promise just wasn’t compelling (if you’re making $150,000 a year and I promise to help you get to $160,000…that’s not an exceptional jump for you). So I dropped the $10k promise and stuck with the money-back guarantee. Since then, I’ve worked with folks negotiating at Google, Amazon, Tesla, Samsung, Verizon, and other companies you’ve heard of. And I’ve raised my rate to $2,000 with a plan to raise it again soon. My coaching offering has been a huge boon to my business this year. About one-third of my revenue was from coaching. Initially, I made The Interview Cheat Sheet for my coaching clients. I found that I always gave them the same homework before their job interviews, so I figured I would make a nice cheat sheet for them. I hadn’t launched any tiny products, so this was a good chance to try that. It only made a few hundred dollars, but that was just gravy since I made it for my coaching clients anyway. And now I include it with all my eBook and video course bundles as well. Any time someone buys Fearless Salary Negotiation, I ask them “Are you negotiating an offer for a new job or looking to increase your salary at your current job?” The responses are pretty evenly split. Then I ask some followup questions to see where they might be stuck. I found that I had a really good offering for people who were stuck on interviewing and negotiating and wanted more help from me, but I didn’t have much to offer for those who were hoping for a raise. So I built Get Your Next Raise. It’s a pretty unique self-paced and guided course that walks students through step-by-step process to ask for a raise while I get them feedback along the way. I launched it at the end of November and I plan to promote it heavily in 2017. This is also the first product I have built by working backwards from the specific need I saw to a solution (the course) to a free offering that offers value and helps potential students determine if the course is right for them. I’ve decided to focus 100% of my time and energy on growing my business around Fearless Salary Negotiation, which means I’m sunsetting TaskBook in 2017. This is tough because I still have people reaching out who say, “Why can’t I sign up for TaskBook?”, and I know it would help them. But I simply don’t have the resources to grow two businesses. There’s an alternate timeline where my first big project is Fearless Salary Negotiation, and it fizzles out because I don’t know how to sell or market. Then I take what I learned and build TaskBook, which takes off like a rocket. But instead, I started with a SaaS (pro tip: Don’t do this! ), didn’t know how to find customers, and got distracted by a shiny new thing, which is growing into a business. I mentioned this was a foundational year, and I think that will show through in this section. Here are my high-level stats from 2016. That’s a decent growth rate considering I haven’t done any meaningful paid acquisition (Facebook ads, etc.). One thing I need to work on is learning more about what folks need when they join my list or download a free guide from me. And I need to provide more value and build a better connection with everyone on my list. In September, switched to a new Email Service Provider (ESP) called Drip. ConvertKit was great for getting from zero to almost 2,000 subscribers. But as I tried to do more with my list, engage more effectively, learn about people, I kept bumping into limitations. Drip seemed like the best way to get to the next level, so I switched. To ConvertKit’s credit, many of the things that I left for are starting to show up in their product, so it seems I was just a few months ahead of them. You’re doing the right things, you just need to do more of them and get more traffic. I also began writing and promoting more content at FearlessSalaryNegotiation.com so I would have more content to point people to when they asked questions, and so Google would have a greater surface area of things to find and suggest for search queries. My focus has been on Organic traffic (when people Google things and click through to find the answer) because I think that’s a lagging indicator of all other types of traffic. If I get lots of traction with my content, podcasts, guest posts, social media, etc., that will eventually translate into Organic traffic. As you can see, it’s growing pretty steadily and quickly. I have basically tripled traffic every 60 days this year, so I went from almost zero traffic in January to almost 2,000 visits a week now. I’ve sold almost 1,200 copies of Fearless Salary Negotiation so far. Most of those sales were on Amazon, which is why I launched on Amazon. One cool thing is that I have steadily raised my price and sales continue to improve. So I’m making more sales and getting more revenue per sale. This has been a nice surprise. One concern I had about launching and selling on Amazon was “You don’t know who your customers are!” (this is a common thing I hear in the self-publishing community). This is partially true—I technically don’t know who buys my book because Amazon doesn’t tell me. But! 10–15% of Amazon buyers subscribe to my email list because I point back to my site, where I offer free worksheets and email templates to accompany the book. Some of those folks have eventually become coaching clients, so I see the Amazon version of my book as a sort of combo product/marketing tool/calling card. I worked with about a dozen different clients this year. Not bad considering I didn’t launch my coaching offering until mid-year. I’ve intentionally grown this part of the business slowly because I want to make sure my clients get great value for the price, and because I wanted to iterate on the offering as I got to know more clients. I’ve found that the folks who benefit the most from working with me are experienced software developers moving to larger companies like Amazon, Google, and Tesla, so that’s who I’ve been working with lately. I had a chance to do about 10 talks this year, and they were a lot of fun. As I write this, I realize that all but one of those talks were to engineers or software developers—another sign that focusing my efforts on helping software developers is a good idea. This talk on salary negotiation for software developers for Orlando Devs and The Iron Yard, Orlando was my first of the year and it has almost 7,000 views on YouTube. I also gave several talks at a local code school called Gainesville Dev Academy, where they buy a copy of my paperback for every student. The really fun thing is that talks are easy for me to do—I’m extremely comfortable with public speaking. And they give me a chance to meet developers and see what they’re struggling with. Here’s a one-page summary of my podcast appearances, webinars, quotes, and guest posts. I was on more than 20 podcasts this year. Most of them were software developer podcasts (yes yes, another checkmark for “focus on helping software developers”), and the response was fantastic. I think the highlight for me was talking with my pal Patrick McKenzie on his Kalzumeus podcast. 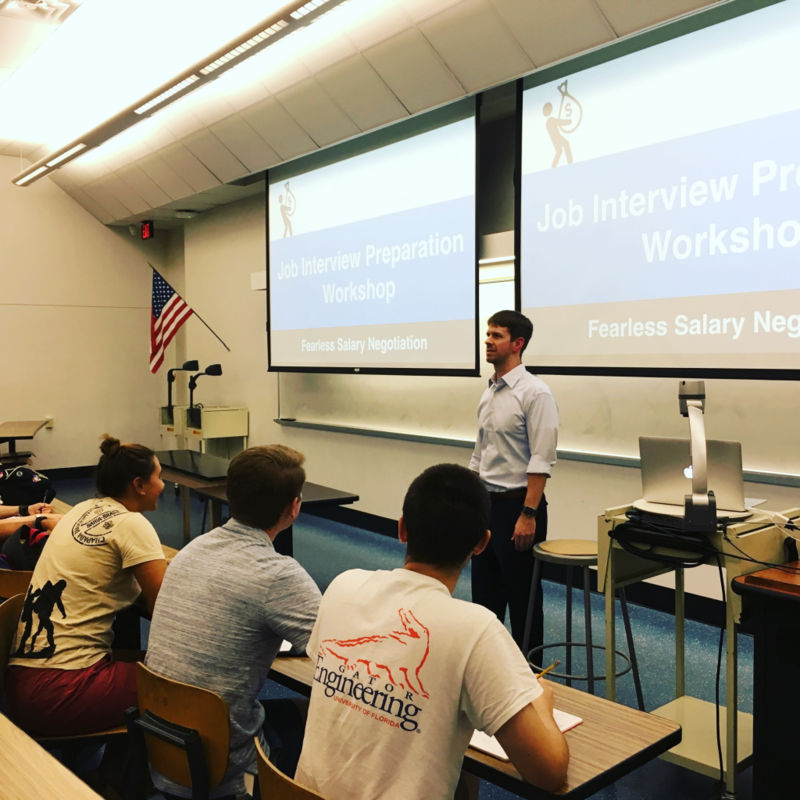 Patrick’s detailed blog post Salary Negotiation: Make More Money, Be More Valued was an early inspiration for me to learn more about salary negotiation, try it for myself, and eventually write Fearless Salary Negotiation. I also participated in three or four webinars, which was great practice. I’m extremely comfortable in the podcast format (probably more comfortable than public speaking), but not as comfortable with webinars where I sometimes need to be on camera, and where the audience is live but invisible. I did four guest posts and was quoted in a Forbes.com article, so that’s pretty nifty. I’ve decided not to share my revenue numbers publicly because there are some drawbacks and I can’t think of any real benefits. That said, I’m basically paying all of my personal and business expenses each month. That’s a big deal for me because it means I’m not spending my savings anymore. Hopefully in 2017 I can replenish the savings I burned through earlier this year. It was a good year. It started slow and stressful, but things turned around mid-year and most of the important graphs are moving up and to the right. I am learning a lot about building and running a business—this experience is invaluable. I’ve spent the past several years getting to know some very smart people, and their guidance has helped me keep focused on the right things and ignore the things that don’t matter. I’m really looking forward to seeing how this business grows in 2017.